The Epistle to the Philippians is a book of the New Testament in the Christian Bible. It is a letter from St. Paul to the church of Philippi. Known as the "epistle of joy" because of its frequent references to joy and rejoicing, the letter was written in expression of Paul's gratitude to the Philippians for their consistent support of his ministry, both materially and spiritually: "Rejoice in the Lord always. I will say it again: Rejoice!" It also deals with Paul's usual theological themes such as the death and resurrection of Christ, salvation, and Paul's opposition to those who insist that Gentile Christians must be circumcised. Besides its joyful character, the letter is also unique in its attitude toward salvation. In Philippians, Paul does not portray salvation as resulting simply from faith in Jesus, but by sharing in Christ's suffering and "working out your own salvation in faith and trembling" (Philippians 2:12). The letter was clearly written during one of Paul's imprisonments, probably at Rome in the early 60s C.E., though some scholars have suggested other places and earlier dates. Virtually all scholars accept Paul's authorship of Philippians, although some think that certain parts of it—for example the reference to "bishops" in the opening chapter and the "kenotic" hymn referring to Christ's pre-existence in "the form of God"—may not be Pauline. The letter was written to the church at Philippi, a city of Macedonia and one of the earliest churches to be founded in Europe. It seems to be primarily a note to acknowledge a generous gift provided by the church to Paul during his imprisonment. The Philippians had sent Epaphroditus, their messenger, with contributions to meet Paul's needs. The apostle prepares to send the messenger back to them with this letter. It is often called the "epistle of joy" because of its grateful tone and its relative lack of criticism of the Philippian church, as compared to the frequent admonishing tone of large parts of most of Paul's other epistles. Pauline authorship of Philippians is accepted by virtually all Bible scholars, ancient and modern. Some critical scholars question the kenosis passage in Philippians 2:5-11 as dating from a later people. Many scholars recognize it as an early Christian hymn, but there is disagreement as to whether it was a psalm that Paul quoted or composed, or which was inserted by a later scribe, reflecting a theology that was not Paul's own. 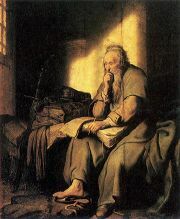 Paul's mention of the Praetorian Guard (1:13) and Caesar's household (4:22), places him in a Roman prison at the time of writing, although some scholars believe the place could just as well have been earlier at Caesaria, where Paul had been imprisoned on his way to Rome; and some suggest he may have been imprisoned at Ephesus even earlier. If from Rome, the most common view, the date would be 60-62 C.E. If from Caesaria, then the date would be the late 50s, since he was imprisoned there for two years before coming to Rome. If the letter is from Ephesus, then it would have been written in the early 50s, and would constitute one of his earliest epistles. Some scholars propose that the letter is actually a combination of several fragments from two or more of these periods. The letter is addressed from Paul and his disciple Timothy to the church at Philippi and with overseers (episcopi—bishops) and deacons. Paul expresses to the Philippians his "joy because of your partnership in the gospel from the first day until now." Although he is "in chains for Christ," Paul believes that his own suffering has encouraged many others to be courageous in their faith. However, he admits that "some preach Christ out of envy and rivalry." These are apparently men who directly criticize Paul—whose teachings regarding the Jewish law were still highly controversial in the early church—"supposing that they can stir up trouble for me." Yet, Paul rejoices even in this case, because "Christ is preached" by the troublemakers. Regarding his own fate, Paul does not fear martyrdom, "for to me, to live is Christ and to die is gain." He encourages the Philippians to "conduct yourselves in a manner worthy of the gospel of Christ," whatever happens (Chapter 1). The Philippians supported Paul materially and spiritually while he was in prison. Specifically, "each of you should look not only to your own interests, but also to the interests of others." Christ himself followed this pattern by "emptying" himself of his divinity and taking on the nature of a servant, dying on the cross for the sake of humanity. Yet, God exalted him, so that "at the name of Jesus every knee should bow...and every tongue confess that Jesus Christ is Lord." Paul praises the Philippians' consistent obedience and urges them "to work out your salvation with fear and trembling" without argument or complaint. He hopes to send Timothy back to Philippians with his message, but is even more eager to send Epaphroditus, their own messenger, who has brought Paul needed material support. "Welcome him in the Lord with great joy," Paul commands, "and honor men like him, because he almost died for the work of Christ" (Chapter 2). "Rejoice in the Lord," Paul again urges, a theme he returns to several times. Yet, he cannot help but warn against his constant adversaries, the Judaizers—"those dogs, those men who do evil, those mutilators of the flesh." It is likely that these are the men, teachers who insisted that Gentile Christians be circumcised, that Paul referred earlier to as stirring up trouble for him. "Put no confidence in the (circumcision of the) flesh," Paul advises, "though I myself (as a Jew) have reasons for such confidence." Here Paul provides some interesting biographical details about himself: he is of the tribe of Benjamin, a Pharisee who opposed and persecuted the church before his own conversion, and "faultless" in his observance of the Jewish law. Yet, all these credentials he now considers "rubbish," for he not longer seeks to have a "righteousness of my own that comes from the law, but that which is through faith in Christ." Yet this faith is not entirely apart from works, for by the "fellowship of sharing in his sufferings, becoming like him in his death," Paul hopes that he and all Christians will "attain to the resurrection from the dead." This is no once-and-for-always proposition, however, and Paul emphasizes that even he has not attained the goal yet, "but I press on to take hold of that for which Christ Jesus took hold of me" (Chapter 3). Paul urges the Philippians to remain steadfast in their faith, calling them "you whom I love and long for, my joy and crown." He pleads especially that two women, Euodia and Syntyche—whom he calls his "fellow workers"—whose names are in the book of life—to come to an agreement with each other. "Rejoice in the Lord always," he says, "I will say it again: Rejoice!" Christians should put aside their anxieties, but petition God in grateful prayer. They should strive for what is noble and good, and follow whatever is admirable in Paul's own example. Finally, Paul expresses his own joy in the Philippians' renewed financial generosity toward him, remembering that they were the only church who supported him materially in the early days of his missionary activities at Thessalonica. "You sent me aid again and again when I was in need...I am amply supplied, now that I have received from Epaphroditus the gifts you sent." He closes with a final greeting and a benediction. The Epistle to the Philippians is a favorite because of joyousness. Paul was clearly happy with the Philippians as with no other church he writes about it. Not only have they given generously to his ministry from its beginning, but they have also been consistently obedient, and—judging by Paul's other letters—seem remarkably free from divisions, moral problems, and heresy. Yet, even to this favorite of his churches, Paul returns several times to his nemesis, the Judaizers, whom he calls evildoers and "dogs," even though he admits grudging that they do "preach Christ." It seems that Paul faced opposition from these teachers, even in the most distant of lands from Judea. Nor is the Philippian church entirely free of other problems, as seen with the disagreement between Paul's two female co-workers, whom he seeks to reconcile without comment on the nature of the issue or how it should be resolved. Theologically, Philippians is remarkable in that its doctrine of salvation differs from the strict "faith-not-works" position Paul stakes out in Galatians, Romans, and elsewhere. He instructs the church to "continue to work out your salvation with fear and trembling" (2:12). Paul also states that he himself hopes to share in the resurrection not simply by faith in Christ's atoning death, but by "sharing in his sufferings, becoming like him in his death" (3:10-11). Paul's "kenotic" hymn may or may not be his own, but in either case it became an important text in the development of later Christology, and the "divine economy" in which Jesus is seen as pre-existing as God the Son and "emptying" kenosis himself to take human form in order to die and atone for mankind's sins. What is most memorable in Philippians, however, is Paul's love for the Philippian church and clear sense of joy in their response to him. History of "Philippians, Epistle to the"
This page was last modified on 22 March 2019, at 19:06.